Pacers make trip back to the Eastern Conference Finals. Remember when Reggie Miller scorched the Knicks to become the “Knick Killer”? or when Larry Johnson knocked in a four point playto propel the then 8th seeded Knicks to stun the Pacers? Well, in a rebirth of a classic rivalry from the 1990s, the third seeded Indiana Pacers came out as the better team, as they defeat the second seeded New York Knicks to advance to the Eastern Conference Finals for the first time since 2004. The Knicks came into the playoffs as one of the elite teams in the Eastern Conference. They won the Atlantic Division title for the first time since 1994 and won a playoff series for the first time since 2000 when they knocked off their Atlantic division rival Boston Celtics in six games. Led by scoring champion Carmelo Anthony and joined with this year’s Sixth Man of the Year J.R. Smith, last year’s Defensive Player of the Year Tyson Chandler, Raymond Feltion, Iman Shumpert and Pablo Prigioni to name a few. The Knicks looked poised to take their playoff run further deep. Unfortunately, their title run ends in the second round. They were unable to beat the Pacers on the road and allowed them to take Game 1 on their home floor. It was a bitter finish to their remarkable season and a season where they rejoined the elite of the East. 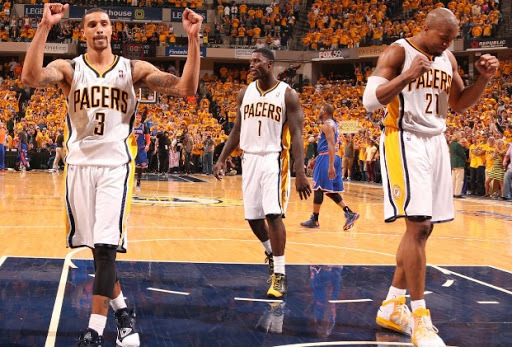 As for the Pacers, after knocking out the Atlanta Hawks in Round 1, they right away stole Game 1 at MSG which is the turning point of the series as the Pacers maintained a perfect home record at Bankers Life Fieldhouse in the 2013 Playoffs which stands at 6-0. Led by Most Improved Player award winner Paul George and joined by George Hill, Roy Hibbert, David West, Lance Stephenson, D.J. Augustin and Tyler Hansbrough to name a few. These Pacers have put everyone on notice as for most of the season, they were under the radar. Now they have a shot of getting back to the NBA Finals for since Reggie Miller led the Pacers to their lone trip in franchise history in 2000. The Pacers will now face the defending NBA champions the Miami Heat in the Eastern Conference Finals setting up a rematch from last year’s second round series which the Heat won in 6 games. As for the Knicks, their impressive run to the East elite comes to a bitter end. A lot of uncertainty will now bloom in the Big Apple as their offseason begins now. The Champs return to the Eastern Conference Finals. The reigning NBA Champions Miami Heat pulled off the same feat they did in 2011 as they knocked off the fifth seeded Chicago Bulls in five games in the second round to advance to their third straight Eastern Conference Finals. After losing Game 1 at home, the responded by winning four straight games to book their ticket to the Conference Finals. The Bulls, coming off a seven game series in the first round against the Brooklyn Nets came in to the second round battered with a ton of injuries from Derrick Rose who has missed the entire season recovering from the torn ACL injury he suffered in last year’s Playoffs, as well as players like Luol Deng and Kirk Hinrich who are vital to the Bulls run in this year’s playoffs. 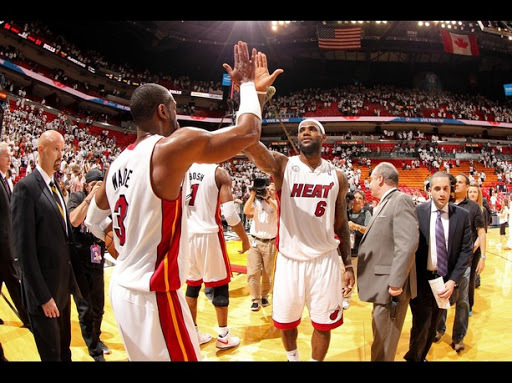 They were able to steal a game in Miami with an impressive Game 1 victory. Unfortunately for them, it would only be their only win of the series. 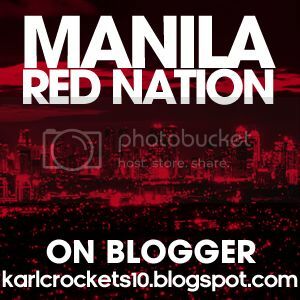 They were unable to defend their homecourt against the reigning NBA champions and eventually suffers from four straight losses that ended their playoff run. 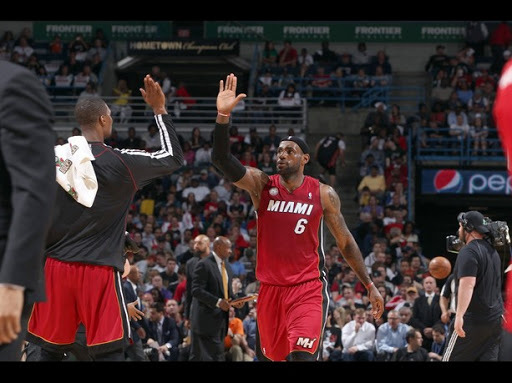 As for the Heat, after sweeping the Milwaukee Bucks in the first round. They were well rested coming into the second round. LeBron James was crowned his fourth season Most Valuable Player award (his second back-to-back MVP seasons). They were heavily favored in this series. They dropped Game 1 on their home floor, however the Heat responded with a vengeance as they blew out the Bulls in Game 2, taking the next two in Chicago with empathic wins and they came back in Game 5 to wrap their series up and move on to the Eastern Conference Finals as their run for the repeat will continue. The Heat will face the winner of the New York Knicks and the Indiana Pacers, in which as of this moment of writing, the Pacers have a commanding 3-1 series lead over the Knicks. As for the Bulls, “The Return” of Derrick Rose may not have happened this season, but with the extra downtine for him, he’ll be back come next season. If he does return, expect the Bulls to come back to the elite of the Eastern Conference. To Luol Deng and Kirk Hinrich, get well soon as well. Chi-town will have better days come next season. 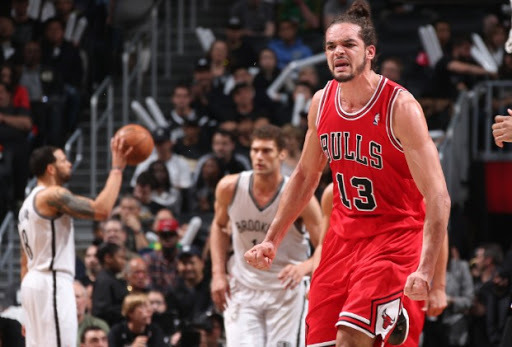 Bulls survive Nets comeback push. In the only first round series that went to seven games, the fifth seeded Chicago Bulls survive a comeback run by the fourth seeded Brooklyn Nets. Thisafter the Bulls go up 3-1 in the series, they allowed the Nets to come back and force a 7th game on the Nets’ home floor. However, the Bulls sealed the series on the road to advance to the second round. The Nets had a great first season since they moved from the Garden State of New Jersey to the New York City borough despite going through a coaching change during the middle of the season as Avery Johnson who led the Nets to a great start, faltered afterwards and was fired thus opening the door to PJ Carlesimo to call the shots for the Nets for the rest of the season. Brook Lopez had an All-Star year for the Nets, this despite Deron Williams having a rough season. Also helping the Nets cause are Gerald Wallace, Joe Johnson, Kris Humphries, CJ Watson and Andray Blatche to name some. The Nets took the opening game of the series. They lost the next three, but fought back to even the series and force a 7th game on their home floor. But their comeback bid came up short as their first season in Brooklyn ends in a tough home defeat. As for the Bulls, they played all season long without their superstar Derrick Rose who was cleared by his doctors to play as early as January after his rehabilitation from the torn ACL he suffered in last year’s playoffs. Despite not having Rose on the floor, the Bulls kept themselves competitive led by All-Stars Luol Deng and Joakim Noah as well as Carlos Boozer. Outside of the frontcourt trio, they have Nate Robinson, Kirk Hinrich, Jimmy Butler, Taj Gibson and Marco Belinelli to name some. They survived a comeback bid in this round as they went up 3-1 but lost the next two to set up a seventh and decisive game which they won on the road. It is still unclear if Rose will come to play in the next series, but the Bulls need to push themselves more in order to keep their playoff push alive. The Bulls will face the defending NBA champions Miami Heat in the second round who are well rested after their sweep of the Milwaukee Bucks in the first round. As for the Nets, they will look back on this series and the question on whether their head coach PJ Carlesimo will be back full time to call the shots next season, but as they say pro sports in Brooklyn is back. 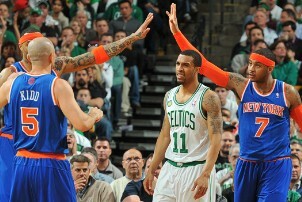 Knicks survive emotional Celtics rally. In a emotional battle between two rival cities, the second seeded New York Knicks survive a comeback push by the seventh seeded Boston Celtics who came back to won two games after trailing the series 0-3. The Knicks would take the series in six games and advance to the second round for the first time since 2000. The Celtics managed to come back to the playoffs despite losing their superstar point guard in Rajon Rondo to a season-ending foot injury. Led by their trusted veterans in Paul Pierce and Kevin Garnett, the Celtics keep themselves above the win column despite getting hit by the injury bug all season long. They also got big contributions from Jason Terry, Jeff Green, Brandon Bass and Avery Bradley all season long. They were down 0-3 in the series and managed to put the Knicks on the brink of a 7th and decisive game back in New York. They trailed by 20 points in the 4th quarter and managed to bring the lead down to four. But the Knicks, made all the stops in the final three minutes of the game to seal the series. Despite bowing out in the series, the Celtics fought with a lot of heart and determination especially coming off the Boston Marathon tragedy which is well appreciated by any NBA fan. The Knicks, led by the new scoring champion Carmelo Anthony won the Atlantic Division title for the first time since 1994. They showed their dominance in this series by going out with three straight wins on the Celtics, before the Celtics won two straight to extend the series before bowing out in Game 6. Anthony is backed up well by J.R. Smith, Tyson Chandler, Raymond Felton, Steve Novak and the rest of the Knicks roster who have been playing great basketball in the Big Apple. The Knicks now continue their run back into contending for a championship come June. The Knicks will face the third seeded Indiana Pacers in the second round who wrapped up the sixth seeded Atlanta Hawks in similar fashion. Setting up a rebirth of a classic Eastern Conference rivalry. As for the Celtics, question now looms on whether Paul Pierce and Kevin Garnett on whether they will cap off their careers in Boston together with the returning Rajon Rondo or move elsewhere to finish their illustrious Hall of Fame worthy careers. Pacers advance to Round 2 for 2nd straight year. 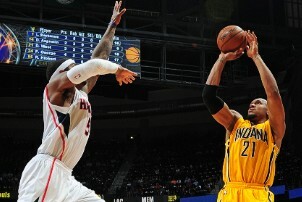 In a series full of double-digit victories, the third seeded Indiana Pacers wrapped up the sixth seeded Atlanta Hawks in six gamesto advance to the second round for the second straight season. The Hawks returned to the playoffs for the sixth straight season, that is after they lost one of their main men in Joe Johnson through a trade with the Nets. They were led by Josh Smith who should have been an All-Star this season if not for his off-court troubles. Al Horford had another great season in a Hawks uniform. While Jeff Teague had a career year. They also got help from Kyle Korver, Deshawn Stevenson, Ivan Johnson to name some. They fought their hearts out especially coming back in Game 6 from a huge deficit, but they eventually came up short on their home floor. As for the Pacers, they won the Central Division title for the first time since 2004 despite losing their main man from their last playoff run Danny Granger to injuries which kept him out for most of the season. With Granger’s absence, Paul George stepped up his game leading to a All-Star season for him. Together with David West, George Hill, Roy Hibbert, Lance Stephenson and DJ Augustin. The Pacers turned around a bad start to their season as they were able to get back in third place in the Eastern Conference standings. Now, they’ll be back in the second round as their playoff run to prove continues. The Pacers will now face the second seeded New York Knicks who wrapped up the seventh seeded Boston Celtics in similar fashion as the Pacers setting up a rebirth between these two fierce rivals from the 1990’s. As for the Hawks, the spotlight is now on Josh Smith who is a free agent this offseason, will he stay in his hometown team or move to another team for next season? A lot of uncertainty lies in “The Highlight Factory” this off-season. "Texas Sized Sweep" in Hollywood. In a battle of two of the most decorated and battled tested teamsin the Western Conference. The team from the Lone Star Statedealt a sweepon the team wearing the purple and gold for the second time in three seasons. 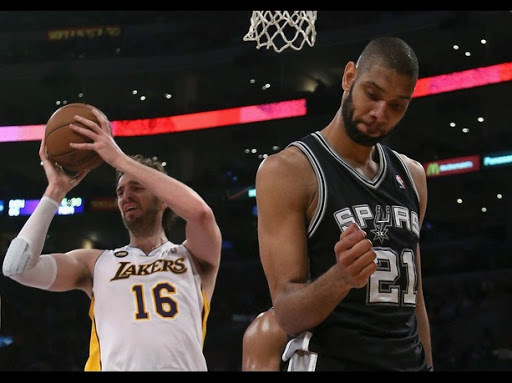 As the steady San Antonio Spurs knocked off a injury-riddled Los Angeles Lakers out of the playoffs in a sweep to advance to the second round. The Lakers dealt with a lot of injury issues throughout their short playoff run this season as they lost the big star in Kobe Bryant to a knee injury prior to the start of the playoffs. But it wasn’t only Vino who got the injury bug as almost every Laker player went through injuries throughout the season from Dwight Howard, Pau Gasol, Steve Nash, Steve Blake, Metta World Peace, Jodie Meeks to name some on a season where expectations on this star-studded lineup were very high and unfortunately, ends up on a massive tail-spin which will be remembered for many years to come. Last time the Lakers got swept in the playoffs was 2 years back when another Texas team, the Dallas Mavericks took them out in the second round on their way to the NBA championship. However the difference this year is that the Spurs swept the Lakers on the road. Unlike the Mavericks who swept the Lakers on their home floor. The steady Spurs took out the Lakers by a margin of almost 19 points a game. Led by their veteran triumvirateof Tim Duncan, Tony Parker and Manu Ginobili. The healthier Spurs took full advantage of the Lakers’ injury woes. Including two huge road victoriesto wrap the series. The Spurs also enjoy a huge supporting cast featuring Kawhi Leonard, Danny Green, Tiago Splitter, Gary Neal, and Matt Bonner to name a few. Of course, directed by their long-time head coach Gregg Popovich. The Spurs are poised to put their six year Finals absence behind them and win it all as their Drive for Five continues. The Spurs will face the winner of the series between the Denver Nuggets and the Golden State Warriors. As for the Lakers, there are a ton of questionscoming up for them in the off-season as Dwight Howard will be a free agent this season. As well as a ton of players on the trading block and who knows what may happen to head coach Mike D’Antoni during the off-season. The Champs just "Sweep the Deer"
Well, in what I will say as the most lopsided matchup I have ever seen in the NBA Playoffs. It’s the defending champions + best team in the NBA this season against a team who made it to the playoffs with a losing record. The defending champions proved to be too much for these “Young Deers” as the Miami Heat will continue their quest for a repeat as they knock off the Milwaukee Bucks in a sweep to advance to the second round. The Bucks fought hard in this series as they kept it close against the Heat fueled by the bold statement guard Brandon Jennings gave prior to the playoffs, in which he said that they will knock the champions out of the first round. Well, last season, the 8th-seed in the East Philadelphia 76ers knocked off the top-seeded Chicago Bulls in six games, as the Bulls who lost Derrick Rose to a torn ACL in their Game 1 victory was never the same team that topped the NBA afterwards. The Sixers would have a nice battle in Round 2 against the Boston Celtics, they took them to 7 games before losing on the road. Unfortunately for Jennings and the Bucks, his statements backfired and the Heat just swept them out of the playoffs with big margins averaging almost 15 points a game. LeBron James has been on a tear for the Heat, leading their chase for the repeat as he is well on his way to winning his 4th MVP Title and a second back-to-back after doing it with his old team, the Cleveland Cavaliers back in 2009 and 2010. The spotlight may be on him, but he’s getting help with the rest of the infamous but star-studded trio of Dwayne Wade and Chris Bosh. As well as the rest of the roster from Ray Allen, Chris Andersen, Shane Battier, Mario Chalmers, Norris Cole, Udonis Haslem to name a few. The Heat are a well-oiled machine and still the favorites to represent the East in the NBA Finals this season. The Heat will face the winner of the series between the Brooklyn Nets and the Chicago Bulls in the second round. (As of the time of this writing, the Bulls lead the series 3-1, with Game 5 coming up tomorrow in Brooklyn). As for the Bucks, they picked up hard lessons from this series. Especially on a season of transition as they switched coaches from Scott Skiles to Jim Boylan (which happened before in Chicago). They are one of the youngest teams in the NBA and still have a lot of room to grow in the years to come.